Order ‘Jetpack Dreams: One Man’s Up and Down (But Mostly Down) Search for the Greatest Invention That Never Was’ by Mac Montandon, available from Amazon.com by clicking on the book cover above! I want a damn jetpack. Is that so hard to understand? There was actually a guy on the “Jimmy Kimmel Show” recently who had one and used it to fly around Hollywood High’s football field in Los Angeles. But he was on the show because it was unusual. I think everyone who wants a jetpack and has the balls to use one, should have one. It’s not like I’m asking for some silly flying car, like in the Back to the Future movies. No, that would be silly. And while we’re at it, I want to drive a really cool car that doesn’t look like every fourth car on the road. Is that too much to ask? Mac Montandon knows exactly what I’m after. 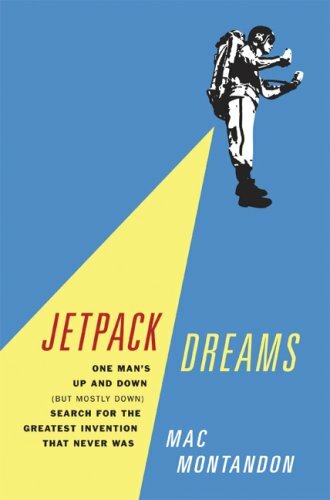 He wrote the book, Jetpack Dreams: One Man Up and Down (but Mostly Down) Search for the Greatest Invention That Never Was. Let’s see how crazy I really am.